Norwegian Cruise Line's forthcoming ship, Norwegian Breakaway, goes on sale today. 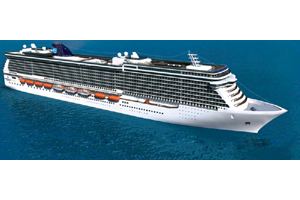 The newly designed ship, part of Project Breakaway with sister ship, Norwegian Getaway, combines the style of the NCL's Jewel class ships, with the innovations of their largest ship, Norwegian Epic. The ship will combine the cruise line's favourite signature venues, including The Haven, with a whole host of new innovations, lounges and restaurants. Norwegian Breakaway sets sail on her inaugural season in April 2013, offering seven night sailings from New York to Bermuda. The 144,017 tonne ship will carry 4,000 passengers and almost 1,600 crew making her the largest ever ship to use New York as its home port. Her inaugural sailing, from Southampton to New York, is now on sale with prices starting at £889pp. The NCL Breakaway's round-trip cruises from New York to Bermuda begin in May 2013 and have also gone on sale today, with prices starting at £1839pp. The Norwegian Breakaway is part of a growing choice of action-packed ships, but with her unique cruise offering the bright lights of New York either before or after a seven day cruise to the sun blushed beaches on Bermuda, she offers something a little different to the usual Mediterranean and Caribbean itineraries.